Plastic screw posts are a new variation of an old idea. They provide a modern look where screw posts are a good solution but a more modern look is desired. Also, they're quicker to assemble since they just snap together instead of needing to be screwed on. The size given in the description is the thickness of your material that the post will handle. We sell these posts in packages of 100 posts and screws. Screws are threaded, but you can just push them into the posts without having to thread them in. 1/8 inch screws do not have screwdriver slots. All larger sizes are slotted. The screw and post heads are 3/8 inch diameter. All sizes are available in black, white, and clear. You should make the hole slightly larger than the post to prevent tearing. A 1/4 inch or a 5/16 inch hole is recommended. The posts will be slightly smaller than this hole, which makes inserting the posts easier. Make a test sample if you are using materials other than the standard paper and cover stock to see what hole size works best. Use a paper drill if you need to put holes in a large number of sheets of paper, or stacks of cover stock, foam core, and similar materials. A drill is also much less effort to use than a hand-operated punch. For holes in wood, metal, plastics, etc., use a drill press with a bit suited to the material. Check with the supplier or the manufacturer of the material you are using for the proper type of bit to use. This is where these posts excel. 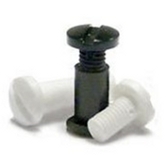 Plastic screw posts are available in lengths starting at 1/8 inch. These tiny posts are suitable for only a few pages. Remember to select posts long enough that the screw will snap in all the way. Posts that are too short can pull apart in use, so make them too long rather than too short. Screw posts are a quick and easy way to assemble many types of signs, retail displays, and similar items. Use whatever materials you want, then drill or punch the proper size holes for the screw posts. Select the screw post length to be the same or slightly greater than the total thickness of the materials you are assembling. Once you have everything ready, just insert the posts and snap them together. It couldn't be easier.